On Captain Andy's Na Pali Snorkel Adventure, you'll experience 5 to 5 1/2; hours of sailing and snorkeling on a remote tropical reef along the world-famous Na Pali Coast. You'll see spectacular sea cliffs, enchanting waterfalls and timeless lava tubes, and enjoy the history and legends of the ancient civilizations that once inhabited these verdant valleys. Breakfast, lunch, beverages and snorkel gear included in the tour. Receive a discount for booking on-line. Get to the fun faster aboard the 65' Holo Holo power cat, offering daily snorkeling excursions to the Napali Coast and the island of Niihau. 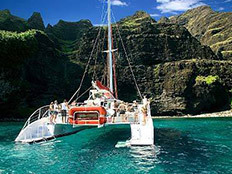 Or, experience true Hawaiian trade-wind sailing on Leila, Holo Holo Charters' luxurious 50' sailing catamaran. 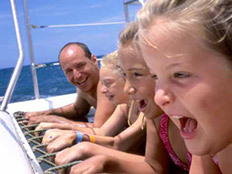 Book online and save $15 per person! Tours depart from Port Allen Marina and include food, beverages and complimentary snorkel gear. Voted the #1 scuba dive operation on Kauai by the readers of Scuba Diving magazine (October 2006) and Best Of Kauai 2006 to 2010 People's Choice Awards. 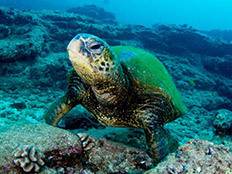 Dive with Hawaiian sea turtles and explore ancient lava tubes. Niihau and Whale Watching charters available. Daily shore and boat dives. Spacious boats with showers and restrooms. Kids programs to Instructor training. Classes offered: PADI, NAUI and SSI. Nitrox available. PADI 5 Star IDC Training Center. Established in 1983. Also in our shop: Snorkel/scuba rentals and sales, boogie board and surf board rentals, one hour photo, and aloha/beach wear. Open seven days a week.